​Trail Conditions: All trails are open with the exception of trail 13 from Marengo to trail 13 west just south of Ashland. Current detour is on Trail 9 between Marengo and Ashland. The Ashland County snowmobile community lost one of their very best members this past March. Terry Olby’s legacy will live on for generations to come. This dedicated man could fix almost anything with a rubber band! He was known for his welding expertise which came in extremely handy for the Ashland & Bayfield County Snowmobile Alliances, where he built a drag for the county. He was always quick to adapt to situations, whether it was removing or replacing bridges, brushing, cleaning up after storms, or creating new trails; Terry was a visionary when it came to finding solutions. If his wife Beth were unable to find him around the house, all she had to do was look in the groomer barn and chances are Terry would be there. Getting the groomer ready for the yearly Christmas parade was a task Terry met with vigor, even running the possible risk that his wife, Beth, would call in the authorities for stolen reindeer yard decorations. Instead, the reindeer were found traveling down Ashland’s Main street! 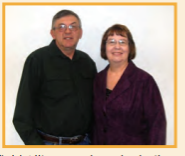 Both Terry and Beth volunteered hundreds of hours to the local snowmobile club, serving as president and secretary. Terry averaged 400 hours of service to the Ashland County trails yearly. Although his love for snowmobiling was strong, his love of family came first. In one of his better “rubber band” moments, he attached skis to an old recliner so Beth, who had been laid up, wouldn’t miss the fun. Terry is a very special person to many people, especially his grandchildren. His premature death is an enormous loss to anyone who had the pleasure of knowing him and to the snowmobile community. Ashland Snowmobile Club / P.O. Box 1023 / Ashland, WI 54806. ​The AWSC is dedicated to the preservation of snowmobiling in Wisconsin and is continually advocating for new trails as well as maintaining and enhancing existing trails. In addition, the AWSC monitors regulations and proposed legislation that could affect snowmobiling. Without the watchful eye of the AWSC, Wisconsin would not have a network of 25,000 miles of snowmobile trail which is ranked in the top three trail systems in the nation. 2015 AWSC Groomer of the Year! Wisconsin's snowmobile trail system is made possible by the volunteer efforts of AWSC snowmobile clubs and members. Each year, the AWSC solicits nominations for their "Of The Year Winners" to recognize those club membes who go above and beyond. ​We are proud to announce that our very own Don Santama has been named Wisconsin's 2015 Groomer of the year! Thank you Don for all your years of hard work and dedication! If you would like to congratulate/thank Don feel free to send us an email and we will make sure he receives it! The mission of the AWSC "United We Trail - Divided We Fail" is to provide information, direction, education, and resources to our members, and member clubs to promote, improve, and preserve safe responsible snowmobiling throughout Wisconsin, the snow belt states and the international snowmobile community. Wisconsin, well-known for its pristine snowmobile trail system, is regarded as one of the top three snowmobiling destinations nationwide. These trails are made possible though the volunteer efforts of snowmobilers who are members of an AWSC club. These club volunteers have the responsibility of securing trail easements, placing necessary signage on the trails, brush, groom and maintain trail grooming equipment. ​By belonging to an AWSC snowmobile club, you are helping to keep the sport strong by having your legislative voice heard at the Capitol in Madison as well as in Washington, DC. In addition, your membership fees enable the clubs to continue to improve their trail system which benefits local economies as well as Wisconsin's tourism economy.